Why Is Keyword Research Important For Your Blog Post? Content writing is a major aspect in building your own website. Therefore, your goal is to write quality content that people want to read. Without content, it is impossible to rank your website in search engine like Google. Having a powerful content writing platform is equally important to help you to write readable content. 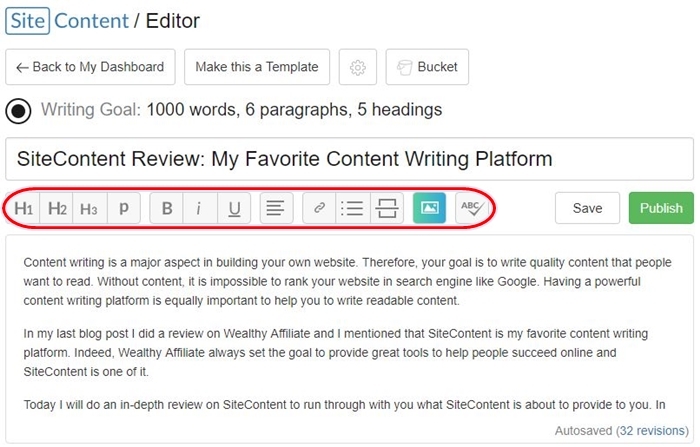 In my last blog post I did a review on Wealthy Affiliate and I mentioned that SiteContent is my favorite content writing platform. Indeed, Wealthy Affiliate always set the goal to provide great tools to help people succeed online and SiteContent is one of it. Today I will do an in-depth review on SiteContent to run through with you what SiteContent is about to provide to you. 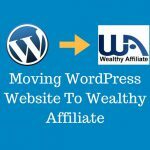 In case, you want to learn more about Wealthy Affiliate, you can read my review on Wealthy Affiliate here. Without further ado, let’s see what is SiteContent all about. SiteContext is a new tool just released by Wealthy Affiliate few months back in June. 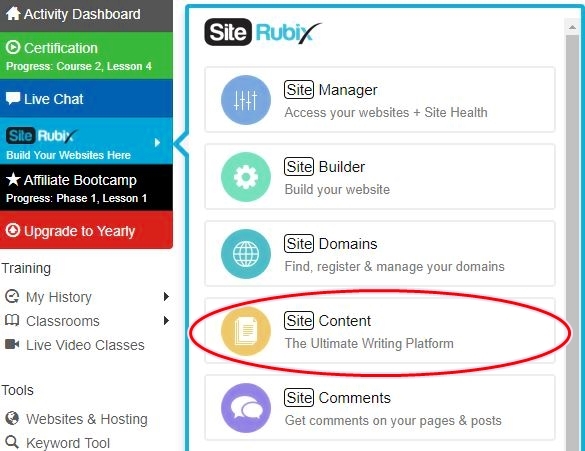 It is a powerful content writing platform inside SiteRubix. 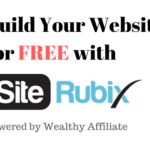 By the way, if you do not know what is SiteRubix, the SiteRubix is an easy to use website builder and hosting platform by Wealthy Affiliate. The main goal with SiteContent is to streamline your writing experience by not only improve efficiency but also better organization of your website publication. Publish articles to your website. Articles indexing status in Google. Stats and goal setting function to help you track you writing progress. Content template’s creation function for you to create a content template for repeating use in similar content. For example, product review post. Powerful grammar and spelling checking function to help you “polish” your content so that it is grammatically correct and spelling error free. 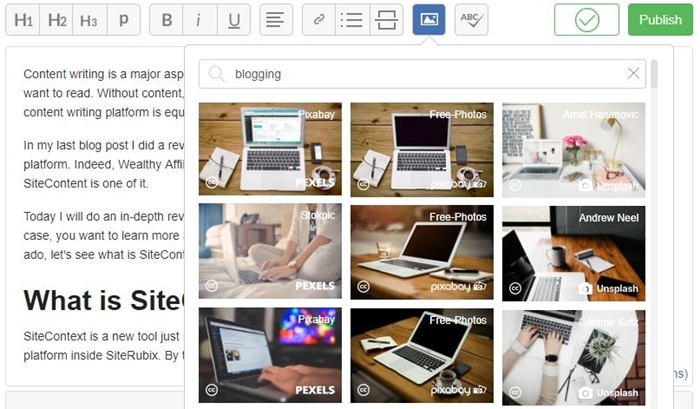 SiteContent Images is a function to help you manage your content’s images. The last 2 features “Add Image” and “Grammar & spelling checking” are something that make me exciting. I will talk about these 2 features in later section. How do you draft your blog post content? I used to use Microsoft Word to draft my content before copy it to WordPress for publishing. The reason I used Microsoft Word is that it shows me the words count and also I used the review function for grammar and spelling checking. This process is rather tedious and slow. The worst thing is that I lose all formatting of my writing after copy to WordPress and I have to redo it. The big win about SiteContent is that it is a centralized content writing platform. You can do all the writing, editing and formatting of you blog post in SiteContent. Adding image, grammar and spelling checking can be done here as well. Once everything is done and you are ready to publish your blog post, what you need to do is to use the “Publish to website” button to publish them to the selected website. As simple as that! Consistently writing quality content for your website is the biggest challenges you will face from time to time. This is especially true when you want to write a quality keyword rich content with sufficient word count (great content usually consist of 1000 to 2000 words). Therefore, setting a goal and tracking your progress of each word you type are very important. I am happy that Wealthy Affiliate adopted this feature in SiteContent. 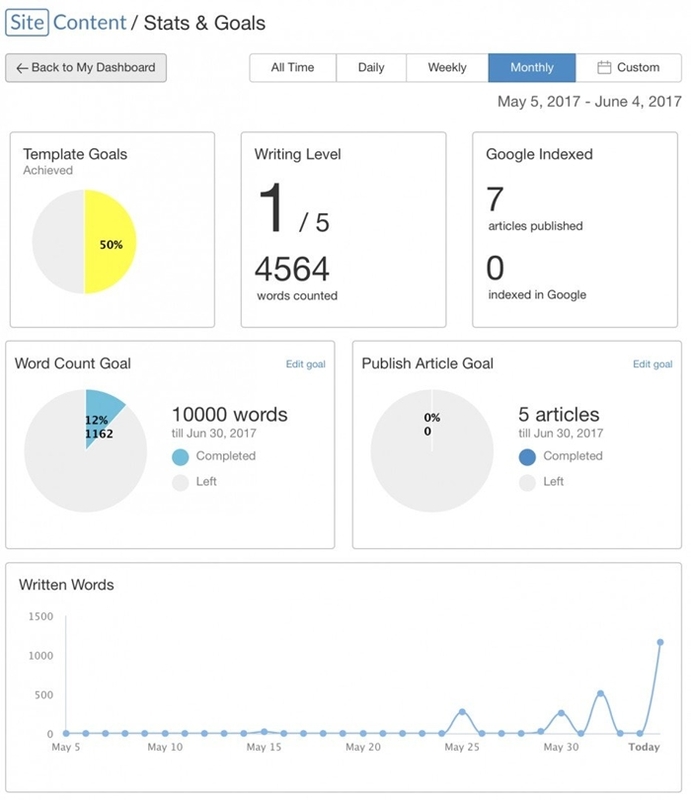 You can now set your goals for word count and also number of article you targeted to publish so that you can work toward to meet them. The stats will show you the progress of each goal you set so that you can track and making sure to archive the goals. This is a very useful feature for you to create template that outline your blog post content with same structure. It makes your writing faster and easier. You can even set your word count goal, number of heading and number of paragraph in the content template. Personally I created 2 templates for my writing, one for keyword rich blog post and the other one for review blog post. You should always target to write great content that your readers want to read. So, what is great content? One of the important aspect is user experience. Hence, grammar and spelling of your content become an important factor that can influence your readers’ user experience. Try to imagine what if you were reading an article that are full of grammar errors and wrong spelling. Would you enjoy? The answer is very obvious, you wouldn’t enjoy. The good news now is that SiteContent is built-in with powerful grammar and spelling checking features. What it does is to scan through your content to check for any grammar, spelling, punctuation and sentence structure errors. This feature will definitely help you in creating a content that it is grammatically correct and spelling error free. It also improve the readability of your blog post. Human are visual by nature. Therefore, if you can add relevant image to your website blog post, it will definitely improve your content readership and engagement. However, the biggest challenge with image is finding them especially to find free image. Recently, Wealth Affiliate introduced a new image manager feature in SiteContent called the “SiteContent Images”. The good news here is that you will have access to over 1,000,000 optimized images! Basically, you have 3 options to insert image into your content. Insert an Image from Search. You can search from a database of over 1,000,000 optimized images and use them for free. These images are very high quality professional photos from three industry leading image repositories in Pexels, Unsplash, and Pixabay. Drag and Drop Image. You can upload images manually from your computer by dragging and dropping images into your content. Recently Used Images. You can reuse the past images through the “Recently used images” section. There is also a crop function for you to format your image in either square/rectangle crop or circle crop. Personally, I don’t use the circle crop as I don’t like my images in circle shape. Are You Ready To Give SiteContent A Try? Since you are still here reading, then I am sure you like the features listed above and would like to try out SiteContent. Here is how you can get started with SiteContent. 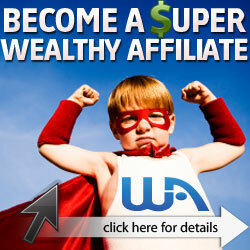 Join Wealthy Affiliate FREE starter membership to get started. But I suggest you to read my review on Wealthy Affiliate here to learn more about it first. Build your own website. You can go through the “Getting started course” here. Lastly, I suggest you to see the “Creating Your Initial Website Content” training course to get started with SiteContent. That’s all. You can now start using the SiteContent and enjoy all the features I listed above for FREE! Content writing is the most important activity in website building. So you have to constantly improve your writing skills. Besides that, a powerful writing platform like SiteContent would definitely streamline your writing process for ultimate efficiency. Lastly, I would like to thank you for reading my SiteContent review and I hope you enjoyed this review. Note: Be sure to read my Wealthy Affiliate review and get started with a FREE account. How to Setup Contact Form 7? 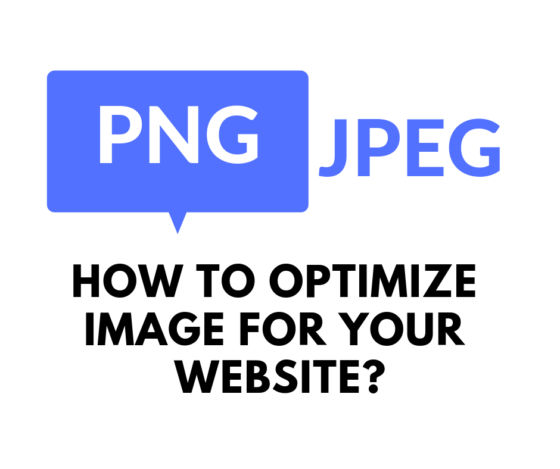 How to Optimize image for Your Website? 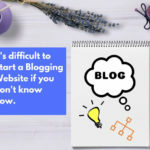 It’s Difficult to Start a Blogging Website if You don’t Know How. Subscribe to my mailing list and get a FREE training course! Copyright © 2019 KwahChoonHiong.com. All Rights Reserved.